So, here is a peek into the world of Dana Treat. I will often start writing a post hours (or even a full day) before I actually post it. I start thinking about the story behind a recipe and will start on that track before I get a decent photo and before I type in the recipe. For today’s post, I had a long story about how I have made this Strawberry Shortcake before, many years ago. I wrote about how I tried bringing it over to a friend’s house assembled and how it totally slid into disaster (literally slid) before we even arrived. 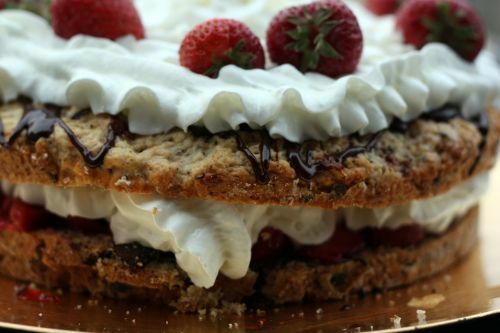 I wrote about how I had the brilliant idea these many years later to bring the bring the components of the cake (biscuit, strawberries, chocolate sauce, whipped cream) over to a different friend’s house and to assemble the cake on site. I wrote a few witty things (namely that I don’t usually like strawberry shortcake because if I am going to eat cake, I’m not interested in a biscuit masquerading as cake) and I was looking forward to taking photos and posting the recipe on our return home. Well, instead of bringing the lovely slightly sweet and vanilla spiked whipped cream, I accidentally brought the feta and Greek yogurt mixture I had prepared in advance for Tuesday’s meal. In my defense, they were both white and whipped looking and both were in glass bowls. This mistake necessitated my husband making an emergency trip to a local market where they didn’t have whipping cream but they did have this. So this is what I used. As I was putting it all together, a full third of the cake broke away from the rest and the spray can whipped cream started melting on contact. I do have to say that the flavors were lovely. Fresh local strawberries can cover up for a lot of mistakes. So can homemade chocolate sauce. But I feel confident that I will never make this dessert again. If you want to attempt it, you can find the recipe here. Normally, making a mistake like this and having a cake that I spent a lot of time not turn out would have totally bummed me out. But the truth is that it did taste good and I made ice cream. Somehow I made it through my whole life up until very recently without purchasing David Lebovitz’s The Perfect Scoop. Really, I made it through my whole life up until very recently without using my ice cream maker. 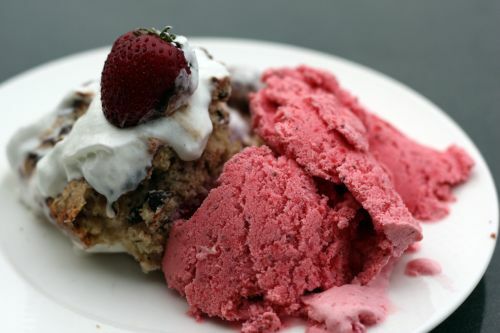 Any dessert you make, no matter how simple – or how disastrous, is dramatically improved by pairing it with homemade ice cream. People go nuts over it. For the amount of joy it brings, ice cream should be extremely difficult and time consuming to make. But it is just the opposite. This one in particular is not custard based so it really just a matter of slicing strawberries, letting them macerate in a little sugar and vodka, and then whizzing them and a few other ingredients together in a blender. A rest in the refrigerator and a swim in the ice cream machine and you are done. Is it the perfect strawberry ice cream? I would have to say no. I’ll try another recipe another time. But this one certainly worked well enough to distract people from the the mistakes of the cake. Refrigerate 1 hour, then freeze in your ice cream maker according to the manufacturer’s instructions. Hmm Yummy! I love strawberry shortcake. What a great idea serving this with ice cream too. It made me laugh out loud that you had brought the feta and yogurt instead (which sounds delicious by the way)! Good thing the ice cream was there to save the day, though it all looks delicious. I have just recently found your blog and I really have enjoyed your posts! Beautiful and inspired. I am sorry about the feta mix-up. It’s great that you found a quick remedy and that you had such a good attitude about it. Yummy!! I love the idea of sour ice cream. I often find desserts too sweet and this really appeals to me. I have been craving a dessert like this!!! That cake is over the top!! Beautiful pics! I am really enjoying your site. One question about the ice cream, what do you feel the vodka adds to this recipe and if you don’t have vodka around what would you suggest substituting? Maybe the cake recipe carries some kind of curse–even though it looks great. The strawberries, chocolate sauce, and ice cream look to have made up for it and then some! Hahaha – hey, at least it makes me feel better about my kitchen misshaps! Although it might not be your ultimate recipe, the strawberry ice cream looks fabulous. I am soooo hungry right now! That’s looks sooo delicious! I came over to your blog from Under the High Chair because I saw that you were going to serve your family ice cream for dinner and I thought, “Now there’s my type of person!” I just served ice cream for supper to MY family the other night. I don’t even apologize (and they didn’t ask me to). I don’t own The Perfect Scoop, but I’ve been on the look-out for it. Our silly library doesn’t even carry it. Might have to make an investment. I love, love, love The Perfect Scoop. Just bought it a few months ago, and I am so excited to try all the creative recipes this summer. Your strawberry shortcake and ice cream look delicious. I look forward to hearing about more Perfect Scoop recipes as you try them. 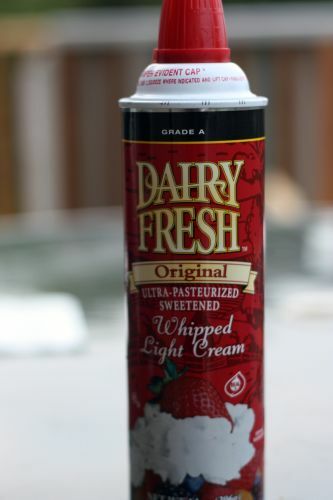 Please let me know the company website of above whipped lite cream. It will be so useful for me to make some delicious desserts.